From waynah.net - music section. Umami Coastjack live in 2012. Umami Coastjack [ , pron. 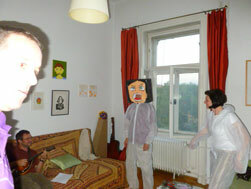 U-ma-mi ka-i-gan jak-ku] is a band or creative umbrella formed in Budapest, Hungary in 2012. Born from the musings of Ilfordi Vén during a daydream involving inventing band names for posters for fictitious festivals the name Umami Coastjack was spontaneously created. In Spring 2012, needing a whole new direction from the then limp hibernating Fattyú Hattyú band, Ilfordi started to experiment with slow gradual mathematical distortions and overlays of simple set-ups of electronic instruments. It was indeed time for a lively, not too serious experiment and to throw a mirror up to the long known phenomena of Engrish, what with its signs, t-shirts and clothing displaying bizarrely translated slogans coming from the Far east. Bright lights, symbols and signs of Far Eastern amusement arcades and Japanese youth style. graphics, manga and a splash of tradition were the inspiration. 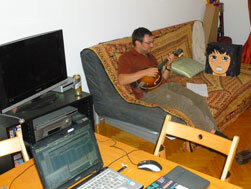 Peti, from the Eugenia Formació, once slated to fill the much troubled guitar mantle in Fattyú Hattyú was persuaded to jam along and provide a live Mandolin layer of sound to compliment the laptop and keyboard that Jekku was using to compose with. The first concert took place on Friday 14th of September 2012 at Klub Vittula in Budapest, Hungary. Jekku and Peti took the stage whilst Gareshen (formerly Kis Greta of Fattyú Hattyú) and Dikasu provided movement and dance, (billed as "Stageworkers" on the gig poster). Also involved were video projections by Jekku/Naneta with Gareshen acting. The concert was videoed by Aron. .and more when we can remember who they are. Plus I am the Coastman, a warped instrumental remake of The Beatles' I am the Walrus. Currently no notes, except the brown one. 2 Space Kitten - photos on Styleomad's blog too.